British regimental number research. First World War research. Military research. British Army regiments. Regimental numbering sequences between 1881 and 1918. Regimental number series. Other rank prisoners of war 1914. The 1st Battalion of the East Lancashire Regiment was formed on 1st July 1881 from the old 30th (Cambridgeshire) Regiment of Foot. The 2nd Battalion of the East Lancashire Regiment was formed on the same day from the old 59th (2nd Nottinghamshire) Regiment of Foot. There are over 39,000 East Lancashire Regiment pension and service records (for this regiment - and its antecedents) in various War Office series held at the National Archives. Clicking on the link will take you to the results on Findmypast but you will need a subscription or Pay-Per-View credits to actually view the records. Some of these records can also be viewed on-line on Ancestry although Findmypast has by far the most comprehensive service record collection. Use the regimental numbers and dates on which these were issued, below, to determine parameters for when your own East Lancashire Regiment ancestor would have joined up. Note though that these numbers are only for regular enlistments. Special Reserve and Territorial Force battalions operated completely separate regimental number sequences. 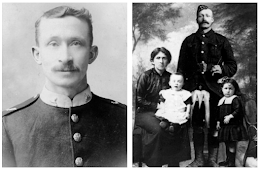 This post will look at East Lancashire Regiment numbers issued between 1881 and June 1914. Service records for all of the East Lancashire Regiment soldiers listed above, can be viewed in the WO 363 and WO 364 pension series at The National Archives in Kew, London. These papers are also now on-line via the Ancestry website. CLICK HERE for a FREE 14 day trial. 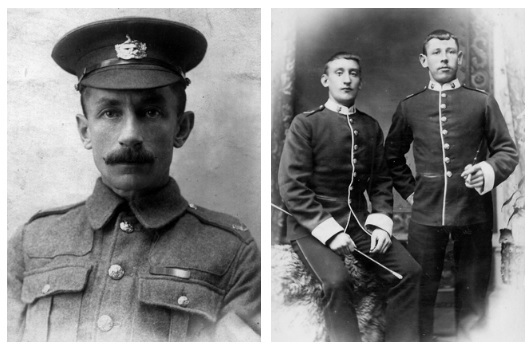 When Britain declared war on Germany a few weeks later, and the East Lancashire Regiment formed new service battalions to accommodate the eager Kitchener recruits, the new battalions drew numbers from the same series used by the regular battalions. I've 'borrowed' the image on this page from the Bolton Museum and Archive website. It shows Private Albert Mitchell of the East Lancashire Regiment and was taken about 1900. An updated and expanded 1923 edition of a history of the old Thirtieth Regiment, later the 1st East Lancashire Regiment, from its formation in 1689 down to 1881, first published in 1887, now re-published by The Naval & Military Press. "The 30th Regiment first saw service in the wars with France that the King fought in defence of his Dutch homeland. It was disbanded, but then promptly raised again as Marines to fight against France in the War of the Spanish Succession, taking part in the successful capture and subsequent defence of the Rock of Gibraltar. It continued to serve in Spain, helping to take Barcelona and Alicante. The 30th helped defeat a French invasion fleet in the Firth of Forth. It was disbanded a second time, but re-formed to meet the Jacobite threat, defended Gibraltar again, and was present at Lord Anson’s naval victory off Finisterre. Fighting as Marines, the 30th took part in the expeditions against Rochefort, Cherbourg and St. Malo (twice). In the American War of Independence it took part in the Battle of Eutaw Springs and later helped to put down two risings of the black population of Dominica. "In the French Revolutionary Wars, the 30th fought alongside the Navy in the Mediterranean, helping defend Toulon against the young Napoleon Bonaparte, occupying Messina and besieging and capturing Malta’s capital Valetta before seeing action in Egypt. 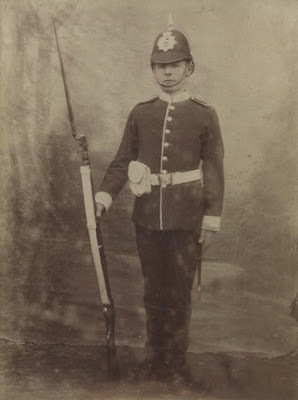 Becoming two battalions, the Regiment saw garrison duty in Ireland and service in the East Indies and Macao before taking part in the Peninsula War. It was with Wellington in the lines of Torres Vedras, which blocked the French attempt to drive the Duke from Portugal, and took part in most of the major British victories in the Peninsula, including Fuentes d’Onoro, Ciudad Roderigo, Badajoz and Salamanca. After the Waterloo campaign, in which it fought at Quatre Bras and Waterloo itself, the 30th was reduced to one battalion again and saw service in the Mahratta war in India. It also took part in the Crimean War at Inkerman and Sebastopol, and saw service in various parts of the Empire until becoming the 1st East Lancashire Regiment in 1881. Illustrated with fifteen fine colour plates showing the evolution of the regiment’s uniforms, and fifteen sketch maps of actions in which it fought, and accompanied by a roll of its officers from 1689-1881 and an index. Republished by the Naval & Military Press, this is the story of a regular battalion from mobilisation to the end of the Battle of the Aisne in September 1914. When war broke out the 1st E Lancs, a regular battalion, was stationed in Colchester, part of the 11th Brigade, 4th Division. The battalion arrived in France on 22nd August 1914 and this book list the officers who embarked with the battalion. This account of the battalion’s experiences in just three weeks includes the Battle of Le Cateau, the retreat to the Marne, the Battle of the Marne and the Aisne crossing. Among the officers killed was the CO, Lt Col Le Marchant It concludes on 10th October when the Battalion entrained for Flanders and includes the nominal roll of officers who went with it. There is an interesting table showing daily distances marched during the retreat to the Marne (thirty miles on 27th August, the day after Le Cateau) and in the week following the end of the retreat and the advance across the Aisne (22 miles on 12th September). This is a graphic account of those first weeks of the war. According to Naval & Military Press which has re-published this divisional history in paperback and hardback, this history "gives a comprehensive account of the division’s exploits albeit with the occasional touch of heroics. The maps are disappointing in that while they show the areas of operations they lack tactical detail. There is, however, a good trench map of the divisional sector on Gallipoli. The photos are very much a bonus. "Amongst the appendices is a thirty-one page Roll of Honour listing the dead and missing by battalions and units, though a footnote observes that complete casualty lists could not be obtained in all cases. The number of dead listed amount to 6,845, including two brigade commanders. Honours and Awards are also shown by units (five VCs in all). There is also a list showing the succession of HQ Staff and commanders down to battalion or equivalent level but without dates of appointment. Finally, and perhaps most annoying, there is no index. 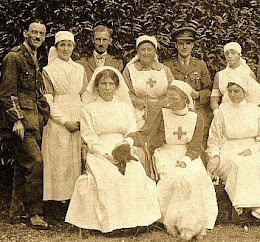 "When, on 10th August 1914, Kitchener called for volunteers among the TF for service overseas (they had been intended for home service only) some ninety percent of the division accepted and a month later the division sailed for Egypt and thus had the distinction of being the first Territorial division to go overseas. In May 1915 it landed at Cape Helles, Gallipoli, and during the next few months it took part in the Second and Third Battles of Krithia, in the fighting for the Krithia Vineyard and the Achi Baba feature. Evacuation of the division began at the end of December 1915 and the last men were taken off on 9th January 1916. During the campaign it suffered 8,547 casualties - 395 officers and 8152 other ranks; two VCs were awarded. From Gallipoli it returned to Egypt and spent the rest of 1916 with the Canal Defences and in the Sinai Peninsula fighting the Turks. In March1917 it arrived on the Western front where it remained for the rest of the war, and when it ended the division had reached the outskirts of Maubeuge, a few miles south of Mons." View East Lancashire Regiment medal index cards, service records and pension records via the Ancestry website. CLICK HERE for a FREE 14 day trial. I also offer a comprehensive, fast and cost-effective military history research service. Follow the link for more information. On this blog you will find a lot of information about regimental numbers and the dates on which these were issued to soldiers joining the British Army between 1881 and 1918. CLICK HERE FOR THE INDEX. I also offer a complete military history research service. CLICK HERE FOR BRITISH ARMY RESEARCH. Find your ancestor! Search 9bn records. "I'm really pleased with the work you have provided, it's been worth every penny and is an excellent service that I would recommend to anyone interested. Instead of just having a picture and a grave, it really feels like my great uncle George's war service has come to life. Thank you." I research soldiers! Click on the Research link to find out more. Bookmark this! This is a complete up-to-date list of newspapers published on the British Newspaper Archive which cover the years 1914-1918. Newspapers add FANTASTIC context and there are gems to be found. Click on my 1914-1918 Newspaper List to see what's available. Each title links directly to the BNA site. 4,500 war diaries, 1.52m pages! "I’m impressed with the level of detail that you have found and your report provides a great summary of their contents, which would otherwise have been very difficult to piece together. When I last tried to track his records down I was told they were all lost." I research soldiers! 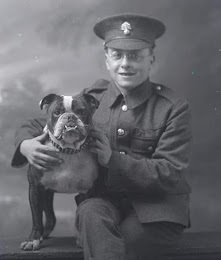 For help in tracing YOUR military ancestor, please visit the RESEARCH tab on this blog. Search over 11.6m records. Add photographs. DID YOUR ANCESTOR SERVE? FIND HIM HERE! Enter NAME, REGIMENT, NUMBER. 1908. What a difference a year makes. When did my relative enlist? When did my grandfather join up? On what date did he join his regiment? A man's regimental number can tell you a lot about when he joined and even which battalion he joined. Note however, that there is a distinction between "enlisted" and "joined". A man would generally enlist once - and be given a regimental number - or army number - on joining his regiment. If he joined another regiment he would be given a different number. He could even be given a different number if he joined another battalion of the same regiment. In all probability this number would not be unique and could be repeated in many battalions and regiments throughout the British Army. This blog aims to guide the researcher through the maze of regimental numbers issued by the British Army between 1881 and 1918. The Army Service Numbers database is a database of British Army regimental numbers. This has been compiled from original sources, principally WO 363, WO 364, WO 96, WO 97 and WO 372 at the National Archives in London. You can search all of these records for FREE on my British Army Ancestors website which provides links to further information on 11.6m men. 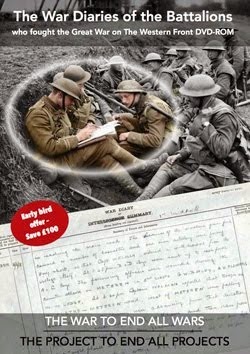 The database covers most units of the British Army which issued regimental numbers between the years 1881 and 1918: Infantry Regiments, Cavalry and Yeomanry, Royal Artillery and Royal Army Medical Corps. What you will find on this blog is data from a far larger data set - generally one number per year up until 1914 and then one number per month from August 1914 onwards. 1. Army Service Numbers for regular battalions are uncomplicated and largely sequential up until 1914. 2. Numbering in the British Army becomes more complicated from December 1915.